Mottisfont Abbey's walled garden has been home to the National Collection of old-fashioned roses since the 1970's when world-famous rosarian Graham Stuart Thomas (who has a yellow David Austin rose named after him), re-designed the former kitchen garden at this former Augustinian abbey for the National Trust. Four decades later, the rose garden is one of the most famous in the world and draws visitors from far and wide to marvel at the wonderfully scented garden. Not surprising when you see what's here ... particularly at this time of year! The Abbey, which dates in part to the 13th century provides a striking backdrop to a 21-acre garden -designed in part by Sir Geoffrey Jellicoe. It sits on the banks of one of the best fishing rivers in England - The Test. 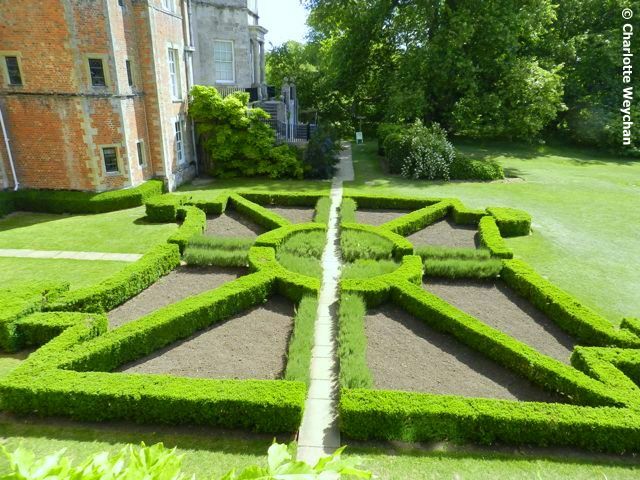 Norah Lindsay was also involved in the garden design here, with her geometric box parterre (above), which is planted with spring and summer bedding plants (although not on the day I visited!). 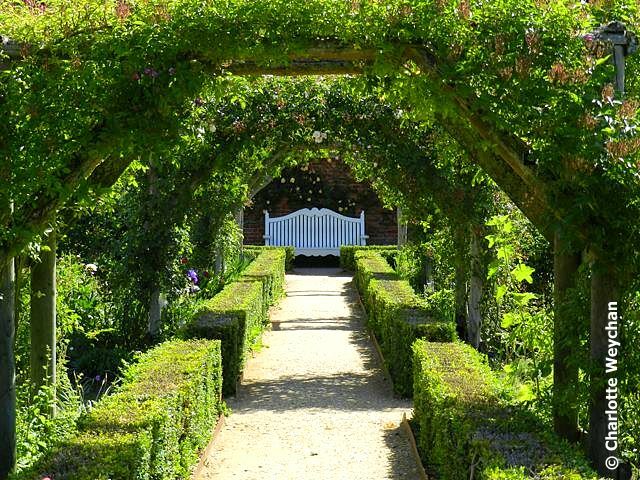 Today it's the famous rose garden that draws visitors from all over the world to Mottisfont. 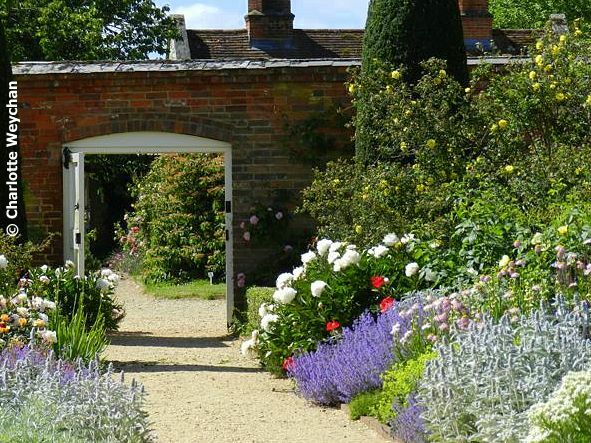 There is little doubt that the walled garden at Mottisfont that will take your breath away, not just because of the roses, but also the exuberant planting. It is divided into four sections, with a circular pool at its centre and paths fan out from the pool, which acts as a central axis. On two sides, the paths are pergola covered (below). But there is hardly an inch of earth to be seen anywhere by this time of year - all you can see is a veritable sea of perennials stretching before your eyes. But at this time of year, it's the roses that steal the show. They are so popular that the Abbey opens in the evenings during June so that you can view them! In his description of the walled garden, Patrick Taylor, well-known British garden critic said: "In late June the exuberance of flower, colour and scent provides one of the most memorable experiences of any garden in the country". High praise indeed! 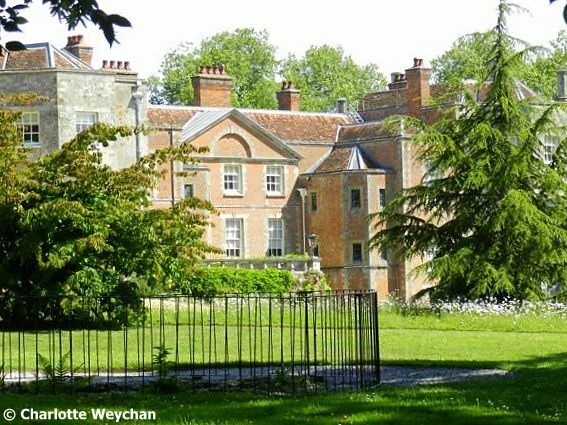 Mottisfont Abbey is open seven days a week at this time of year, from 10.00 to 17.00. Evening openings are scheduled for 10, 11, 12, 17, 18, 19, 24, 25 and 26 June, when the garden stays open until 20.00. Last admittance is half an hour before closing. Free entry to National Trust members. But do check NT website for details as the roses are already in full bloom and there may be additional evening openings added at the beginning of June. 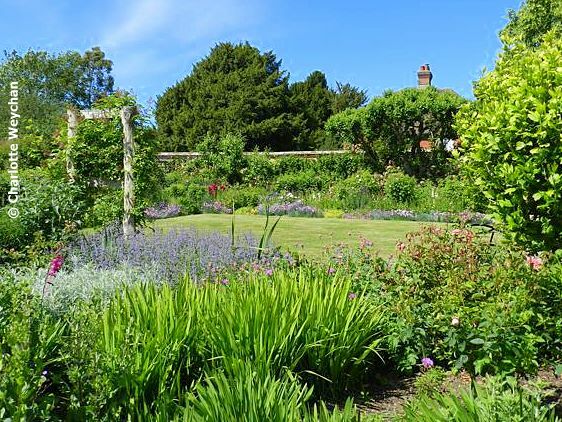 Mottisfont is near enough to the Sir Harold Hillier Garden to visit both in a day and you certainly won't be disappointed. Beautiful and just the right time for the roses. The walled garden looks incredible! I admit, it's the timeless abbey itself that appeals, as much as the splendid gardens. You feel you could 'swim' in such a garden, Charlotte, soaking in every scent and sensation. Britain certainly has gardens that compare to nowhere else, and it's the loving cultivation of them over a long period of time that gives them their patina. Absolutely stunning! It certainly took my breath away just to look at your pictures! Oh, how I would love to visit this garden. Beautiful. Charlotte, your post brings back such memories. Mottisfont is one of my favourite UK gardens. The rose garden always felt like a secret place, tucked behind its brick walls, and then once you're inside it's kapow!! all those sights and smells and textures. Wonderful. Thank you for the tour! That is a spectacular garden. I wish I had the energy to maintain those boxwood designs...they are stunning. 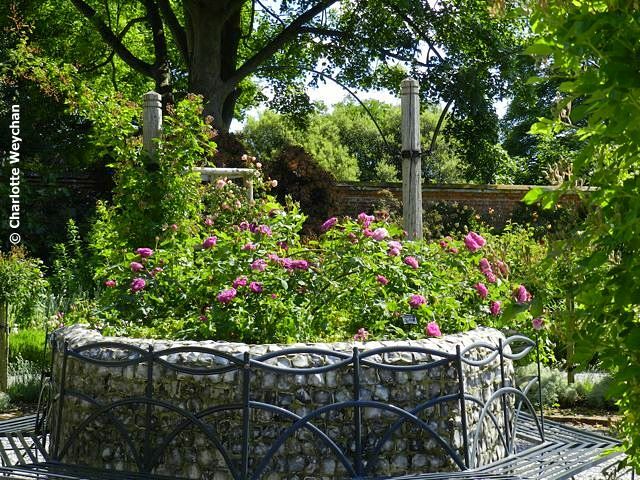 I have a soft spot for this garden, it was where I began to understand roses over 20 yrs ago. When I visited yesterday, it was a shadow of it's former self. Like many Trust gardens, plants are at the bottom list; above only the people that care for them. A brutal attempt at 'regeneration' has left many old shrub roses struggling to produce 3 or 4 weak stems. The wall trained forms are a mess and the clematis that should complement them are weak. The soil is not being fed properly. I fear that the pressure to meet targets, all year opening, detracts from fine gardening. Cutting grass and hedges is more immediate and visible than supporting next years growth. Catering for more and more people absorbs all the resources. We have to live in the real world where conservation of buildings and objects will always win out over the ephemeral but it was a world class Rose garden and we should cherish this, not manage it's decline. I really do hope that it finds it's way but under present management it seems unlikely.